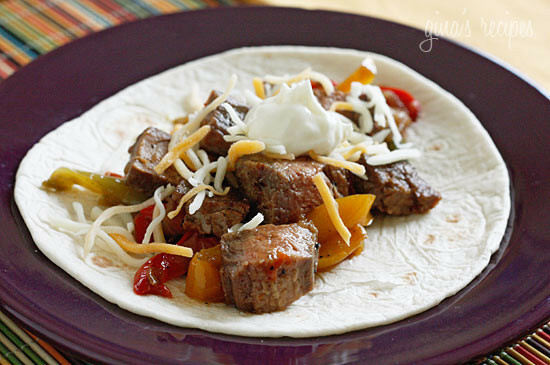 Grilled Steak Fajitas are easy, perfect for a backyard fiesta! Great for a weeknight meal, or fun to create a theme party and serve up all your favorite Mexican appetizers. 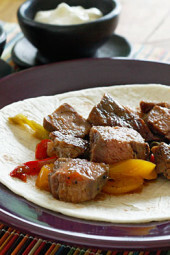 We celebrated Cinco De Mayo a little early this year and these fajitas were on the menu. I’ve mentioned this before, my husband loves fajitas and he is a pro at making them on the grill. My job is to prep everything and season the meat, he does the rest. Win win!! I have these wonderful clay pots from Colombia called La Chamba pots that I love using to make my onions and peppers on the grill; a cast iron pan would work just as well. 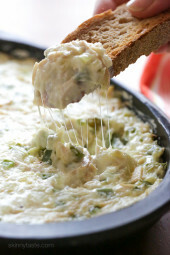 Serve this with Mexican cheese, sour cream and guacamole on the side if desired. 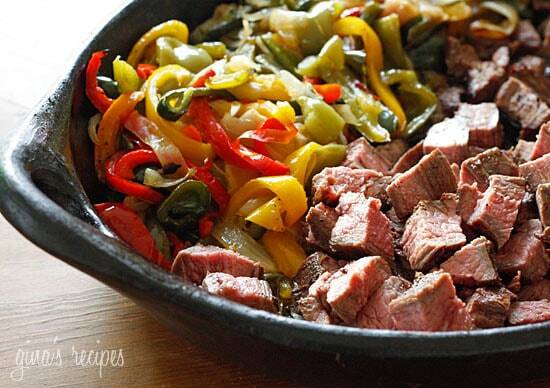 Two fajitas are the perfect serving size. Have a backyard fiesta and make it a fajita party! 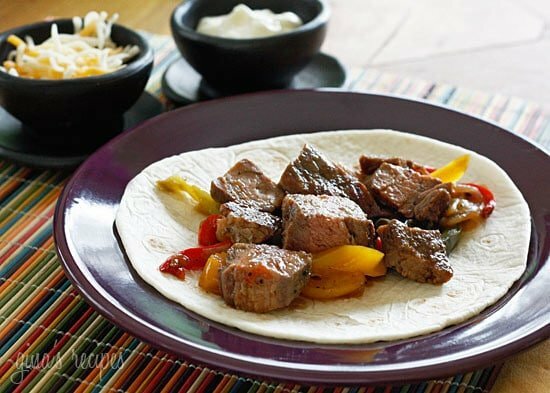 These steak fajitas are easy enough to make as a weeknight meal, or fun to create a theme party and serve up all your favorite Mexican appetizers. (I like to season the steak a few hours ahead.) Pierce steak with a fork all over to tenderize. Season steak with cumin, garlic, scallions, salt and pepper. Allow steak to rest at room tempurature at least 10 minutes before grilling. 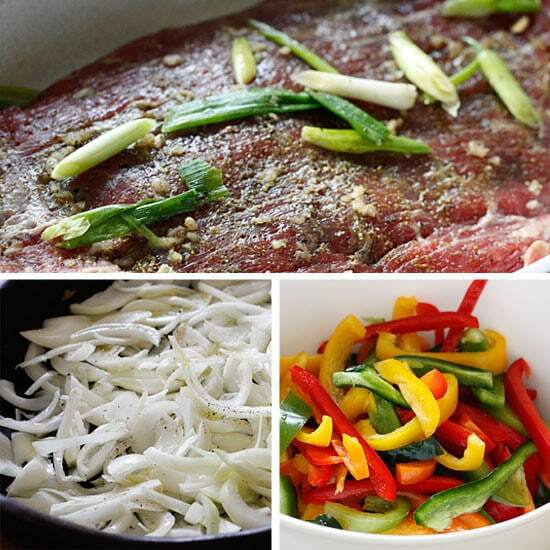 In a large grill-safe pan such as a clay Chamba or cast iron skillet combine onions, peppers, olive oil, salt and pepper. Toss well to coat. Place on the BBQ and cook on medium-low heat, tossing occasionally until onions are caramelized, about 20 minutes. This could also be cooked inside on the stove as well. When the onions and peppers are done, set aside to keep warm on the top rack of your grill; raise the flame of the grill to high flame. Discard scallion and sear steak 4-6 minutes without moving, turn the steak over and cook a few more minutes until rare or medium rare (well done will be too tough). Remove from grill and let it rest a few minutes before cutting. Cut meat into small cubes and combine with the cooked onions and peppers and serve with tortillas, cheese, guacamole and sour cream. There is lots of snow outside…so cooking on the grill isn't really an option. I want to make these for dinner. Can I cook steak on the stove in a non-stick frying pan? Don't have a cast iron. Sure or even in the broiler. I LOVE your recipes! Can't wait to try some. 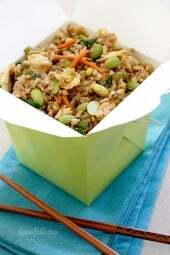 I am trying to figure out how to add recipes to my recipe box. Can anyone help with that? Since they were out of flank steak, my butcher recommended beef sirloin flap meat which was less expensive and equally delicious. Instead of adding sour cream and cheese I added a few thin slices of avocado and a half teaspoon of pico de gallo. My husband and I agree this is our new favorite and plan to take it camping with us this weekend! THANKS SO MUCH FOR YOUR YUMMY CREATIONS! Can you use pre-cut meat for this? If so, would you heat it up with the peppers and onions the same? It's hard to make it on the grill if it's pre-cut, I would cook it on a skillet instead. Thank You, Thank You, Thank You!!! My daughter found you and for the past couple weeks, we've been using your recipes DAILY!! It goes GREAT with our new exercise regime 🙂 Sincerely, Thank You!!!! I made it with chicken and was great. Just put a little bbq sauce. Me encanto. Gracias. Dana, sure or you can even broil them in your oven. You are the best! Everyone enjoys your delightful dishes……………. Bianca – Great idea, 197 calories without the tortillas per serving. Since you are not eating the tortilla you might want larger portions though. I love tortillas… I still have leftovers so I am going to try your recipe tonight for dinner! Thanks dear! I was wondering what the calories would be without the tortilla? I wanted to make it into a salad! I love all your recipes! You're site has definitely turned me into a healthier eater! Yes they sell them at Stop and Shop and Pathmark. Gina Question do you get those Tortillas tell me you get them local somewhere in L.I 🙂 I went looking for them at T.J's but don't see them.. sigh… Thanks darling. You just posted my Friday Night dinner! Thanks Angela, I will adjust! 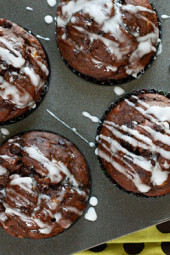 Gina, these look amazing! You listed 6 tortillas in the ingredients, but would it be 12 tortillas total if the serving size is 2? Just checking. Maybe I'll ask my husband to make these for Mother's Day!! I think I love every one of your recipes, we have the same taste in food! 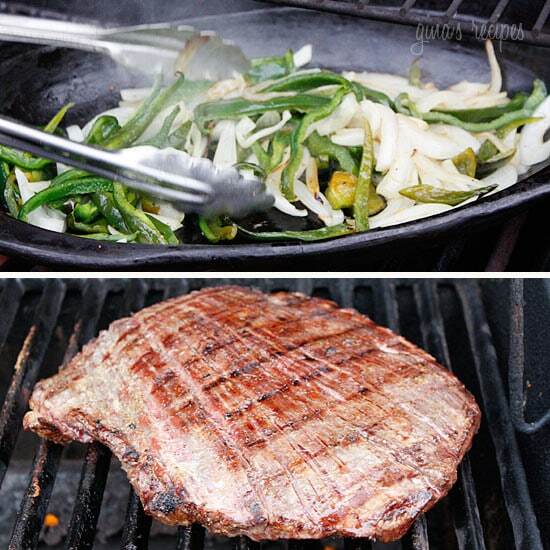 This is no exception, flank steak on the grill is the BEST way to go! Christina, based on the smaller ones. I also have chicken and shrimp fajitas posted in my older recipes. Gosh that looks good! Makes me want to run home and pick up all those ingredients asap! I don't eat red meat, but I bet these would be great using grilled chicken as well! I love fajitas! YUM! I'd love to have these tomorrow, but thinking of going the shrimp route. Are you basing the calorie count on the smaller sized tortillas or a larger sized? I was just craving steak fajitas from my local Mexican restaurant! I think I will stay in now and save some points! Thanks!